While the rule of law is not completely dead, it’s dead enough to justify the title for this quick round up of today’s lawless news. Two big developments on judicial usurpation of presidential immigration and national security powers. By leaving an overly broad TRO in effect that protects even persons who are abroad with no prior connection to the United States, and by refusing to narrow the TRO, the 9th Circuit effectively extended to such persons U.S. constitutional due process rights both to apply for a visa and in the visa process…. I have seen many analyses critical of the 9th Circuit ruling which urge the Trump administration to take a step back, to withdraw the current Executive Order and rewrite it to fit what is acceptable to the 9th Circuit. The Trump administration, according to some reports, is considering doing that. That would be a grievous mistake. The Executive Order, as the Trump administration has said it would be enforced (for example, excluding green card holders from its reach), is perfectly lawful and within the President’s power and authority. To accept the 9th Circuit ruling is to accept that the President does not have the powers vested in him by the Constitution and Congress. And now it’s playing out. Watson, 50, was appointed by Obama in November 2012 and confirmed by the U.S. Senate in April 2013. 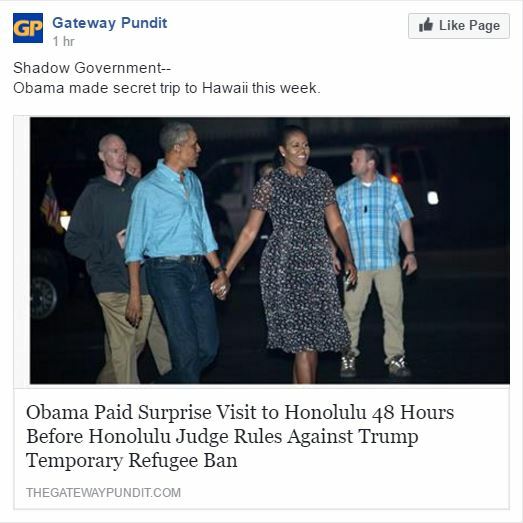 Watson said in a June 2013 interview with the Honolulu Star-Advertiser that he never met Obama at Harvard and knew him only as head of the school’s law review. Yes, Harvard has slightly large class sizes (about 550 students per year), but I find it surprising that Watson claims never to have met Obama. I too attended a large school, and I knew everyone in my year, at least in passing. Yeah, I’m sure there’s nothing there. (Video) Stephen Colbert Eviscerates Rachel Maddow…Hilarious!